Shortly after World War II, the U.S. Army placed captured Nazi rocket scientists in the town of Huntsville, Alabama, to manufacture guided atomic missiles. Wernher Von Braun and friends were not a welcome sight for the town’s well-established, but still jittery Jewish community. Was it possible to move past personal anguish with these new neighbors for the sake of economic expediency? 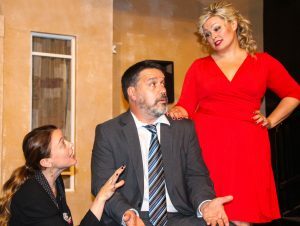 Playwright Mark Saltzman, who is also a screenwriter and seven-time Emmy Award winner, will attend the April 28th performance and lead a talkback. This reading is presented as part of the Holocaust Theater Initiative’s “Remembrance Readings,” organized by the National Jewish Theater Foundation. RESERVATIONS RECOMMENDED at interplayjewishtheatre@gmail.com, or by calling (216) 393-PLAY (7529) and leaving a clear message. Be sure to state which performance you’d like to attend; and how many tickets you’re requesting. SUNDAY, SEPTEMBER 16, 2018, 7 p.m. Widely considered one of the finest jazz violinists of his generation, Aaron Weinstein has been a featured soloist at Lincoln Center, Carnegie Hall and in festivals around the world He’s performed and recorded with jazz icons like John Pizzarelli (who calls Aaron “a perfect musician”), Annie Ross and NY Pops founder, Skitch Henderson. 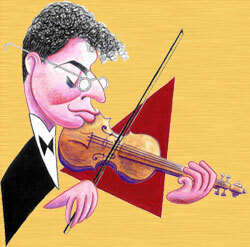 Also a master of deadpan comedy, he’s been dubbed “The Groucho of the Violin” by Tony Bennett. Weinstein appears in celebration of Interplay Jewish Theatre’s 7th anniversary. Wednesday, April 25, at 7:00 p.m.
Fifty years after her liberation from the Nazi death camps, Bracha Weissman still suffers the aftermath of her old trauma. When she allows Ann Meshenberg, the child of other survivors, into her home to take testimony for an archival videotaping project, Bracha considers the legacy she has left her own daughter. The Interview is a story about mothers, daughters and memory, about forgiving and being forgiven. Among the play’s honors: an Ohio Arts Council Individual Excellence Award and winner of three national new play contests. It has been produced on more than three dozen stages around the U.S. in the past 20 years. The event is part of the Holocaust Theater International Initiative’s “Remembrance Readings,” organized by the National Jewish Theatre Foundation. It is supported, in part, by a gift from the late Anne DesRosiers. 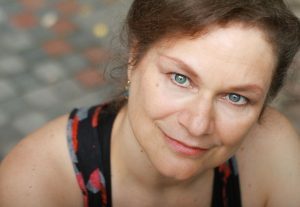 SATURDAY, NOV. 18, 2017 at 8 p.m.
New York-based actor/singer/songwriter ANITA HOLLANDER wrote her evening of original songs to chronicle a journey that began when she was a college student stricken with cancer. A recurrence when she was 26 led to the amputation of one leg, leaving her to perform for more than three decades on the other one. The New York Times review of STILL STANDING called her “provocative, funny, moving, communicative and beautifully polished [with] a wide rainbow of vocal colors that she uses with dramatic sensitivity as well as comic insights…. plus a charming presence that flavors everything she does.” She has performed the show off Broadway, at the White House, across America and around the world. She returns to her native Cleveland for this one-time event, with her sister Rachel signing for the hearing impaired. A $10 donation is requested at the door, by cash or check. The event is underwritten, in part, by the Roy and Eunice Berko Fund at Interplay.